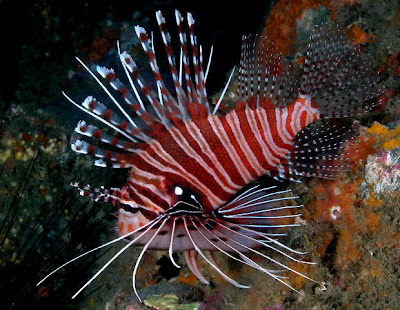 Antennata Lionfish or Pterois antennata is just one of the over 20 different species of Lionfish! Also known as the Ragged-finned Firefish or Spotfin Lionfish it has fan-like pectoral fins and very tall porcupine-like dorsal fins. Take great care if ever coming across one of these fish, the spines on the Antennata Lionfish are venomous just like all other Lionfish. Although not deadly to humans, it has been described as much worse than a bee sting. Use extreme caution when cleaning the tank or when rearranging. This saltwater fish found in the Info-Pacific is a carnivore that prefers a meaty diet of live feeder fish and small shrimp. The Antennata Lionfish should be kept in a fairly large aquarium about 50 gallons with a temperature of 72-78° F and a PH level between 8.1-8.4. This Lionfish can grow to about 7" in length. 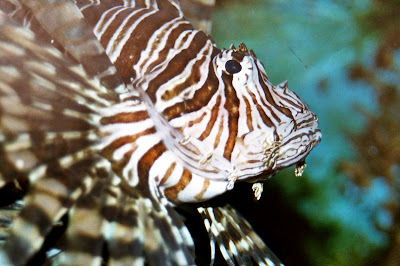 You should be very careful what fish you put in your tank, because the Lionfish can be aggressive towards other fish. If two or more Antennata Lionfish are put together you should try and make sure there are plenty of hiding spots for them to share. Make sure not to have it with other fish that it can swallow or you might come up with a few missing fish.